Ankle sprains are amongst the most common athletic injuries, as they often present with persistent pain and disability(1). 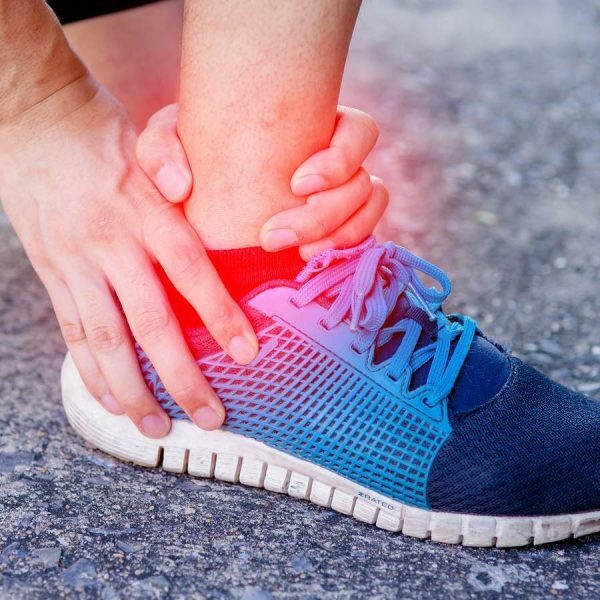 The term ankle sprain also includes the dreaded syndesmosis sprain; the often missed distant cousin to the lateral ankle sprain. Also known as high ankle sprains, they are generally more difficult to detect and are often dismissed as severe lateral ankle sprains. Because of the lack of a precise diagnostic protocol and varying definitions of the injury within the literature, the occurrence ranges anywhere from 1- 18% of ankle injuries among athletes(2). Athletes are often involved in explosive movements, plyometric training, and cutting / changing directions at higher speeds. It is no wonder why they are the perfect candidates for a sneaky high ankle sprain. What is a Syndemosis Sprain? Syndesmosis sprains are injuries involving the inferior tibio-fibular joint. The injury can affect any of the four main ligaments; the anterior-inferior tibio-fibular ligament (AITF), the posterior-inferior tibio-fibular ligament (PITF), the transverse ligament, the interosseus ligaments, and more recently accepted as part of the injury; the interosseus membrane. What is also important to remember, is that the deep fibres of the deltoid ligament also provide stability to the mortise and is often a victim of the high ankle sprain as well. The most common mechanism of injury includes forced external rotation (ER) of the foot, coupled with dorsi flexion (DF), while in weight bearing (WB). The injuries most often occur during high impact and collision sports such as basketball, volleyball, football, cross-country, and down-hill skiing. Difficulty with push off during gait. Positive instability tests (keep reading!). The short answer is no. There is no adequate protocol for assessing syndesmosis sprains with a stress x-ray(3). A positive stress x-ray demonstrates a tibio-fibular clear space of greater than 6mm, 1cm above the mortise, suggesting an injury. However, a cadaveric study performed by Beumer and colleagues in 2003,(4) concluded that all three of the main ligaments needed to be sectioned in order to adequately detect any translation of the fibula. The good news; it is widely accepted in the literature that magnetic resonance imagery (MRI) has excellent sensitivity (100%), specificity (93.1%), and precision (96.2%) for the detection of AITF injuries when compared to the gold standard of arthroscopic exploration of the ankle(5). Several clinical stability tests exist for the detection of syndesmosis sprains, but are poorly supported in the literature(6). Excellent videos exist for the following tests online; keeping in mind there are no clear protocols for the stress tests (ie patient position, non weight bearing (NWB) vs. weight bearing (WB) etc..) and they are not proven to be specific or sensitive in the literature for the detection of syndesmosis sprains. Lastly, the Interosseus Membrane Tenderness Test is worth mentioning. Several systematic reviews(7-9) of high ankle sprains linked the height of the tenderness along the interosseus membrane to the prognosis of the injury with regards to return to play. The distance (in cm) from the distal fibula to the most proximal point of pain (along the anterior-medial aspect of the interosseus membrane)(9-11). Although not a quantified relationship as of yet, Nussbaum and colleauges12 found that the higher the level of the pain, the greater number of days missed from competition among college level football players (p = 0.0001). This could be an interesting measure to consider when determining return to play protocols for high level athletes. Should the Ankle be Immobilized? Again, without much surprise there is no clear agreement in the scientific literature for the immobilization of syndesmosis sprains. Researchers agree that a period of immobilization during healing can be crucial to encouraging an adequate stability of the mortise; however, the time period ranges from immediately to up to 8 weeks post-injury. The general trend is to use your clinical judgement and to treat the injury according to the PRICE (protection, rest, ice, compression and elevation) principal and to gradually develop of dynamic stability and neuro-proprioceptive and motor control of the ankle. No clear specific treatment or exercise protocol is recommended at this time for syndesmosis sprains(7). A syndesmosis sprain is a complex injury that requires individualized care. Often misdiagnosed, the injury can lead to a lengthy recovery and often causes symptoms of chronic pain for the patient. The bottom line addresses the question of ankle stability. Does the ankle have the potential to respond well to conservative treatments and regain an adequate functional stability? If the answer is no, then it may be prudent to consider the possibility of surgical repair. There is no consensus in the literature on how to diagnose or treat syndesmosis sprains. Your own clinical reasoning and experience is currently your best guide! Further research is needed to explore syndesmosis sprains and to develop the best diagnostic and rehabilitative approach for this complex injury. Williams GN, Jones, M.H., & Amendola, A. Syndesmotic ankle sprains in athletes. The American Journal of Sports Medicine. 2007;35(7):1197-1207. Del Buono A, Florio,A., Boccanera, M.S., & Maffulli, N. Syndesmosis injuries of the ankle. Curr Rev Musculoskelet Med. 2013;6(4):313-319. Anand Prakash DA. Syndesmotic stability: Is there a radiological normal? A systematic review. Foot Ankle Surg. 2018;24(3):174-184. Beumer A, Valstar, E.R., Garling, E.H., Niesing, R., Ranstam, J. et al. . Kinematics of the distal tibiofibular syndesmosis. Acta Orthopaedica Scandinavica. 2003;74(3):337-343. Joshy S, Abdulkadir, U., Chaganti, S., Sullivan, B., & Hariharan, K. Accuracy of MRI scan in the diagnosis of ligamentous and chondral pathology in the ankle. Foot Ankle Surg. 2010;16(2):78-80. Kellett JJ. The clinical features of ankle syndesmosis injuries: a general review. Clin J Sport Med. 2011;21(6):524-529. Jones MH, & Amendola, A. Syndesmosis sprains of the ankle: a systematic review. Clin Orthop Relat Res. 2007;455:173-175. Sman AD, Hiller, C.E., & Refshauge, K.M. Diagnostic accuracy of clinical tests for diagnosis of ankle syndesmosis injury: a systematic review. Br J Sports Med. 2013;47(10):620-628. Miller BS, Downie, B.K, Johnson, P.D, Schmidt, P.W., Nordwall, S.J. et al. . Time to return to play after high ankle sprains in collegiate football players: a prediction model. Sports Health. 2012;4(6):504-509. Mulligan EP. Evaluation and management of ankle syndesmosis injuries. Physical Therapy in Sport. 2011;12(2):57-69. Hunt KJ. Syndesmosis injuries. Curr Rev Musculoskelet Med. 2013;6(4):304-312. Nussbaum ED, Hosea, T.M., Sieler, S.D, Incremona, B.R, & Kessler, D.E. Prospective evaluation of syndesmotic ankle sprains without diastasis. Am J Sports Med. 2001 29:31-35. Press CM, Gupta, A., & Hutchinson, M.R. Management of ankle syndesmosis injuries in the athlete. Current Sports Medicine Reports. 2009;8(5):228-233.